A number of public health catastrophes are staring the people of India in the face due to environmental factors. “This means we need to be smart. It means that we must focus on prevention and not treatment. We need to improve the environment, reduce the disease burden and save money in private or public healthcare,” says Sunita Narain, Director General at Delhi-based non-profit Centre for Science and Environment (CSE). To talk more about the threats posed by environmental degradation, Down To Earth and Centre for Science and Environment are releasing an annual report that discusses the connection between environment and health, and focuses on the risk factors that affect our health. Titled Body Burden 2015, the book lays emphasis on threats from air, water, food, forest and climate. Air pollution is one of the top 10 killers in the world and is the fifth leading cause of death in India. It results in about 620,000 premature deaths which are caused by stroke, chronic obstructive pulmonary disease, ischemic heart disease, lower respiratory infections and trachea, bronchus and lung cancer, among others. The report highlights the heightened vulnerability of the poor. It calls for stringent actions on air pollution. “The way forward would be to reduce the source of air pollution—mainly revamping our transportation systems and forcing the industry to come up with cleaner technologies. But people are not aware of these linkages and continue to junk public transport,” said Narain. The report informs that about 37.7 million Indians are affected by water-borne diseases annually. Around 1.5 million children die due to diarrhoea alone, and 73 million working days are lost due to water-borne illnesses each year. Estimates suggest that India loses Rs 36,600 crore every year due to water-borne diseases. Referring to the connection between water and sanitation and malnutrition, the report says that by 2015, the figure of malnutrition should have dropped to 26 per cent as per the Millennium Development Goals (MDGs). But, the country fell short of the goal by seven per cent. Notwithstanding the progress, India still cannot answer why the malnutrition rate among its children is so high. The country’s economy has doubled since 1991, when the government started counting the malnourished children. The world’s largest programme to tackle child malnutrition, the Integrated Child Development Services (ICDS), has been in force in the country since 1975, much before any other country, save the US, introduced measures to tackle the problem, points out the report. Malnutrition is prevalent in comparatively richer states as well. The survey indicates that higher income does not necessarily correlate with better health of children. India loses over US $12 billion in gross domestic product (GDP) due to vitamin and mineral deficiencies among its population. Malnutrition is not just about access to food. Children who are constantly exposed to faecal microorganisms demonstrate environmental enteric dysfunction or EED, where the gut becomes permeable and brings microbial products in contact with blood. This leads to activation of the immune system which down-regulates the growth factors in the body and leads to stunting. States like Odisha, Chhattisgarh and Jharkhand – where more people defecate in open, have more malnourished children, comparatively. According to official data, from 2006-07 to 2010-11, nearly 10 million toilets were constructed every year across the country under the Total Sanitation Campaign. These toilets remain largely defunct and are reportedly being used as storerooms. “Researchers are finding that immediate environmental factors like access to clean drinking water and, most importantly, access to sanitation for both the mother and the child are decisive in determining children’s health,” said Narain. Climate change is leading to greater frequency and intensity of extreme weather events. Simultaneously, India has seen an increase in vector-borne diseases such as dengue and malaria. The report states that the potential period of spread of malaria has increased to 10-12 months (almost the whole year) which is up from four to six months. In Kolkata, dengue transmission takes place for 44 weeks in a year. With a 2.4 degree Celsius rise in temperature, transmission may continue for 53 weeks, increasing the risk of more people getting affected. Around 600 people died due to heat waves in Andhra Pradesh and Odisha in 2015. The report states that local solutions can help. In Ahmedabad, a maternity ward was shifted from the top to the ground floor. The move helped in reduction of heat-related problems in new-born babies. The report informs of the impact of climate change on agriculture on agriculture, and the crop loss suffered by farmers in recent years. “We are seeing an increased severity and frequency of extreme weather events. Farmers in India are facing the double blow of agrarian distress and extreme weather events as a result of climate change,” said Narain. The diseases of animals that were confined to forests are now affecting humans, says the report. These include zoonotic diseases – as many as 2.7 million people die of these diseases every year. These diseases cause illnesses among 2.5 billion humans every year. “The incidence of emerging infectious diseases among both humans and domesticated animals has increased sharply in the recent past. Over the past 70 years, more than 300 zoonoses – diseases transmitted from animals to humans – have been observed. They are increasingly being considered as threats to human society,” says the report. Ebola, the killer virus, is one such disease-causing virus. It was first reported in 1976 and has exploded into a public health emergency. Loss of forests is linked to these diseases finding their way into human society. 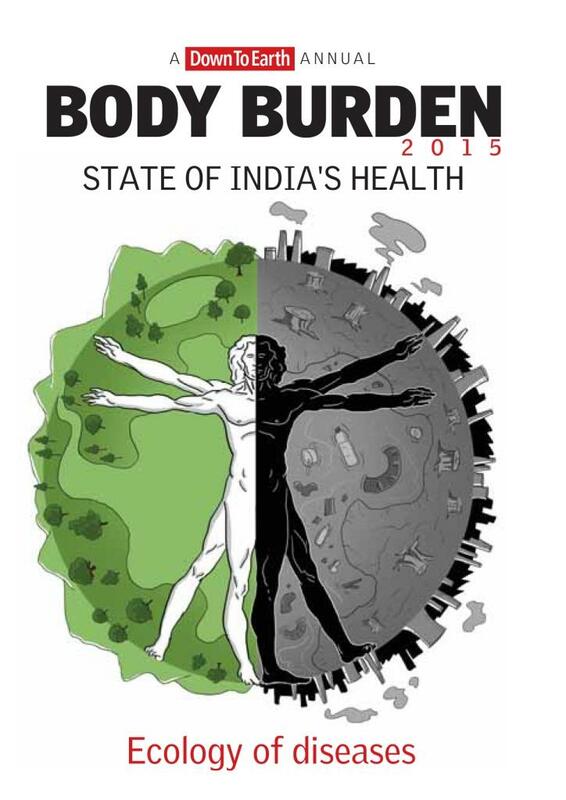 Body Burden also discusses diseases such as malaria and dengue at length. It reports that forest cover declined in most Indian states, the highest in Arunachal Pradesh, Madhya Pradesh, Maharashtra, Chhattisgarh, Jammu and Kashmir and Himachal Pradesh, among other states, between 1999 and 2013. The only states where forest cover grew in this period was in Tripura, Mizoram and Goa. Though India has a huge burden of such emerging infectious diseases, there is very little data on the number of people affected. According to the report, WHO estimates that 13.1 million people in India will die of cancer by 2030. This is 20 times than the current death toll in the country. “Increasing number of studies are establishing that the risk of getting cancer has more do with the state of one’s environment than his or her genetic makeup,” says the report, drawing a connection between cancer and pesticides and other factors. It states that five top five states for pesticide use in the country are Maharashtra, Uttar Pradesh, Punjab, Andhra Pradesh and Haryana. It also cites data which show that cancer is on the increase in urban areas. Noting that Punjab is the cancer capital of India, the report has presented evidence suggesting rampant use of pesticides in the state, and people’s exposure to these. Pesticides have found their way into tap water, ground water and food in Punjab, where incidence of cancer is almost twice the national average. Chemicals present in pesticides can suppress the immune system, triggering diseases that can be fatal. “Since no doctor will issue a death certificate saying that the cause is an unknown trigger, the industry is safe,” said Narain. She said the report has made detailed recommendations on how to regulate pesticide use in the country. “Globally, the maximum residue limits (MRLs) of pesticides are reviewed periodically to incorporate changes in dietary pattern and agricultural practices. But in India, MRLs for registered pesticides are incomplete and have not been reviewed periodically,” said Narain. The report also devotes space and attention to lifestyle-related diseases which are on the rise in India. “There is a very tangible link between our environment and our health. In fact, environmental degradation’s first assault is on our bodies and this is one of the biggest reasons why we try to protect the environment. But the linkage is complex and is often disputed. We need to join the dots. We are often not able to take crucial decisions as we really do not know what is happening to our health and how is it linked to the environment. We don’t know and so we don’t care. There is a conspiracy of silence,” said Narain. The observations made under climate change are highly hypothetical and not based on science. Thank s for the Down To Earth, which has published the very useful, informative article along with the success story of Sri.Kailash Murthy on his farm,without using fertilisers and pesticides. I am also happy that our UAS, Banglore , scientists had visited the farm and endorsed ..The Karnataka Govt needs to recognise such farms and let the actual cultivators to visit such farms.